Thank you for downloading Eight Sec Pro theme. If you have any questions that are beyond the scope of this help file, please feel free to email at support@8degreethemes.com Thank you so much! Now, activate the theme by going to Appearance > Theme > Dashboard. Activate the Eight Sec and Click on “Theme Option” in the Appearance Menu in the Dashboard. Copy the files inside "eight-sec-pro" folder from the zip file of the latest version of Eight Sec Pro Theme. Click on the image that you want to import. 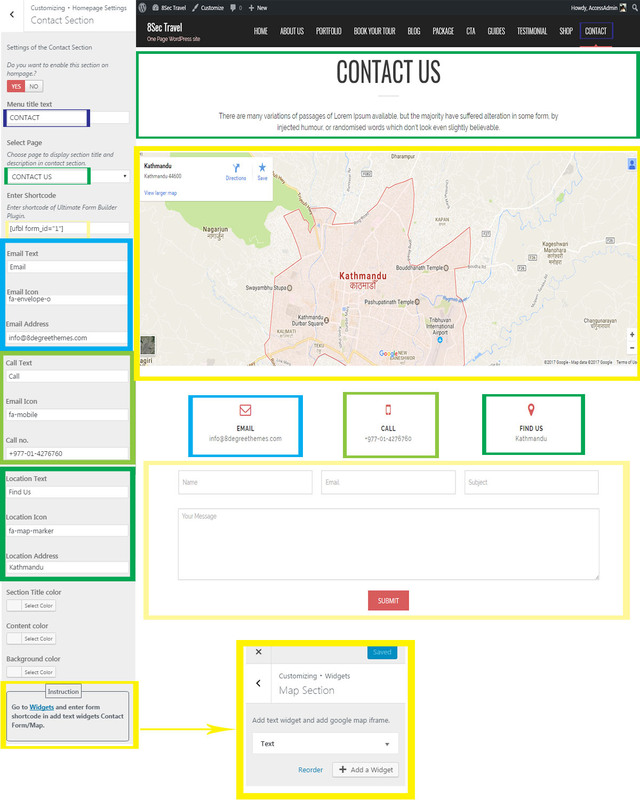 Click on 'Check Layout Here' to check the demo of respective layout. Choose Primary color of theme. Choose Primary Light color of theme. Choose Primary Dark color of theme. Choose Secondary color of theme. This option is only available for homepage layout 3. Choose Secondary Light color of theme. This option is only available for homepage layout 3. Choose a logo for your site. Select “Yes” to show preloader and “No” to hide preloader. Choose color to show in preloader background. Choose web layout for your Site. This setting will be applied for your Whole site. 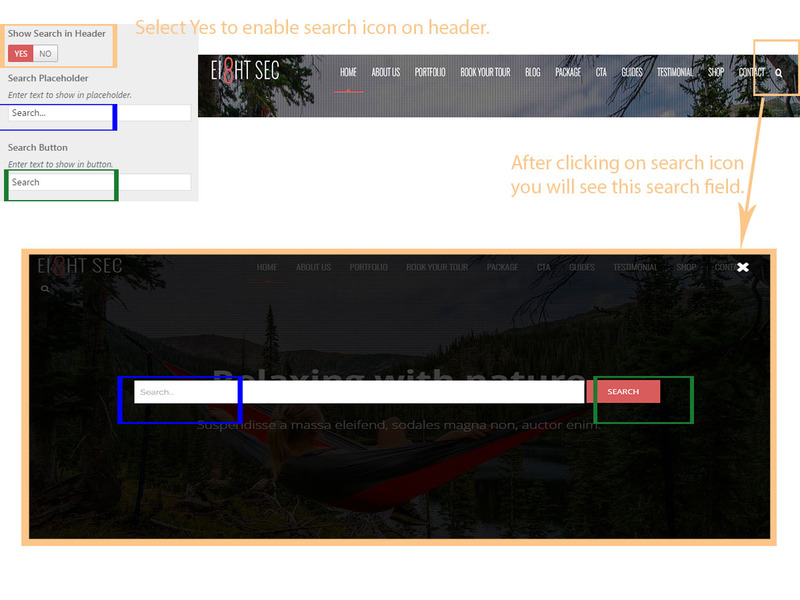 Select “Yes” to enable parallax background effect. 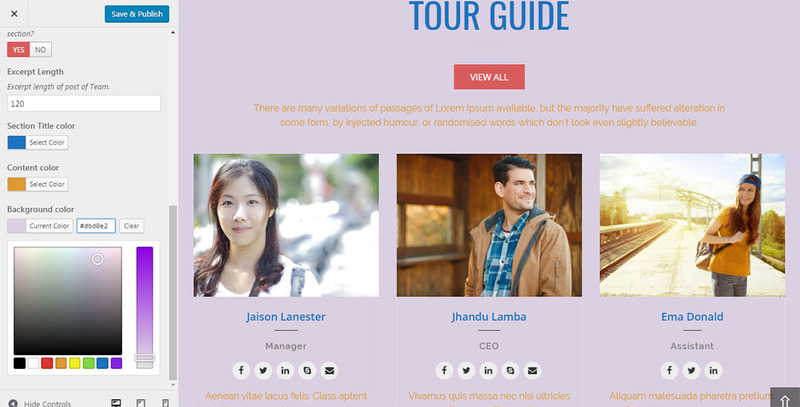 Enter text or Html to show in the footer. Select “Yes” to show search icon in the header. Enter text to show text on placeholder in search text field. Enter text to show text on Search submit button. Select “Yes” to show Eight Sec menu. Enable this option will enable one page menu on homepage. Enter text or Html to show in the top header. Select image to add background image. Select Page to display caption title and description. Enter link in Link1 for first button. Enter text in Button 1 Text for first button. Enter link in Link2 for second button. Enter text in Button 2 for second button. Click add new field to add new form. This will add new slide on slider. Click delete field to delete form. This will delete a slide of the slider. ​Select the post category. The post of the category will be in the slider section. ​Enter shortcode text to use plugin slider. Select “Yes” to show next and previous control on the slider. Select “Yes” to show pager on the slider. Select “Yes” to show caption on the slider. Select “Yes” to enable Auto Transition on the slider. Select “Yes” to enable Transition Type on the slider. Enter number for the speed of Slider Slide. Enter number for the pausing a slide on Slider. Select “Yes” to show About Section on Homepage. Enter Menu title text to add about section on the menu. If text is empty then it won’t show in menu. Select page to display section title and description in about section. Page title is shown as section title, description is shown as section description and feature image is shown as background image. Enter number to show number of post of Service. Select “icon” or “image” to show the feature image of the posts of services. Enter number for Post Excerpt length of post content. Enter text for Read More button for each post. Select color to change the color the title. Select color to change the color of the content. Select color to change the color of the section background. Upload image to show on about section. Select “Yes” to show Portfolio Section on Homepage. Enter Menu title text to add portfolio section on the menu. If text is empty then it won’t show in menu. Select page to display section title and description in Portfolio section. Page title is shown as section title, description is shown as section description and feature image is shown as background image. Enter text for View All button to see all the portfolio posts. Check categories to show post of those categories on portfolio section. To add portfolio posts. Go to Dashboard > Portfolio > New Post. To add portfolio category. Go to Dashboard > Portfolio > Portfolio Categories. Enter number to show number of post of Portfolio post type. Select “Yes” to show Widget Area One on Homepage. Enter Menu title text to add widget area one on the menu. If text is empty then it won’t show in menu. Select page to display section title and description in Widget Area One. Page title is shown as section title, description is shown as section description and feature image is shown as background image. Upload image to show image on widget area one. Select “Yes” to show Blog Section on Homepage. Enter Menu title text to add blog section on the menu. If text is empty then it won’t show in menu. Select page to display section title and description in blog section. Page title is shown as section title, description is shown as section description and feature image is shown as background image. Select “Yes” to show Widget Area Two on Homepage. Enter Menu title text to add widget area two on the menu. If text is empty then it won’t show in menu. Select page to display section title and description in Widget Area Two. Page title is shown as section title, description is shown as section description and feature image is shown as background image. Select “Yes” to show CTA Section on Homepage. Enter Menu title text to add CTA section on the menu. If text is empty then it won’t show in menu. Select page to display section title and description in CTA section. 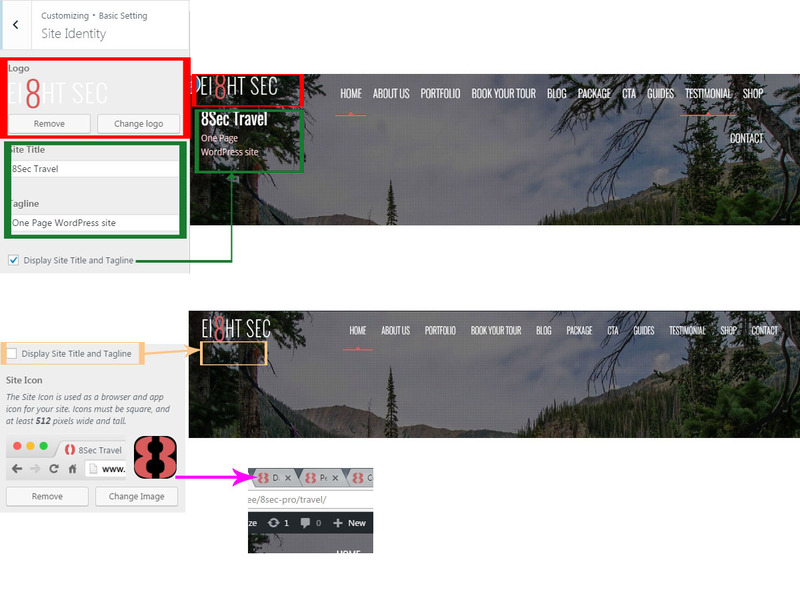 Page title is shown as section title, description is shown as section description and feature image is shown as background image. Enter text to show on CTA button. Enter link of the CTA button. Select “Yes” to show Team Section on Homepage. Enter Menu title text to add team section on the menu. If text is empty then it won’t show in menu. Select page to display section title and description in team section. Page title is shown as section title, description is shown as section description and feature image is shown as background image. Select “Yes” to show designation of the team post on this section. Select “Yes” to show social link of the team post on this section. Select “Yes” to show Testimonial Section on Homepage. Enter Menu title text to add testimonial section on the menu. If text is empty then it won’t show in menu. 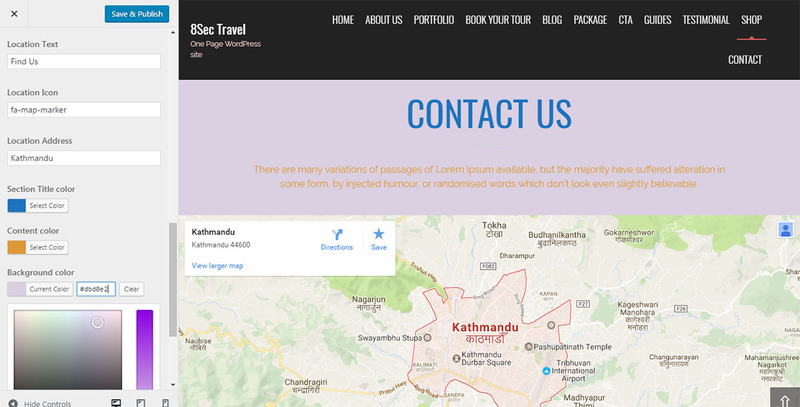 Select page to display section title and description in testimonial section. Page title is shown as section title, description is shown as section description and feature image is shown as background image. Enter number to add the no. of post in slider. Select number to show no. of post in each slide. Select “Yes” to enable transition on testimonial slider. Select “Yes” to show control on testimonial slider. Select “Yes” to show pager on testimonial slider. Select “Yes” to show designation of the testimonial post on this section. Select “Yes” to show social link of the testimonial post on this section. Select “Yes” to show Widget Area Three on Homepage. Enter Menu title text to add widget area three on the menu. If text is empty then it won’t show in menu. Select page to display section title and description in Widget Area Three. Page title is shown as section title, description is shown as section description and feature image is shown as background image. Select “Yes” to show Widget Area Four on Homepage. Enter Menu title text to add widget area four on the menu. If text is empty then it won’t show in menu. Select page to display section title and description in Widget Area Four. Page title is shown as section title, description is shown as section description and feature image is shown as background image. Select “Yes” to show Contact Section on Homepage. Enter Menu title text to add contact section on the menu. If text is empty then it won’t show in menu. Select page to display section title and description in contact section. Page title is shown as section title, description is shown as section description and feature image is shown as background image. Enter Shortcode of contact form plugins. For eg [ufbl form_id="1"] is shortcode of Ultimate Form Builder Lite. Enter font awesome icon text for icon of Email. Enter font awesome text for icon of Call. Enter Phone or Cell number. Enter font awesome text for icon of Location. 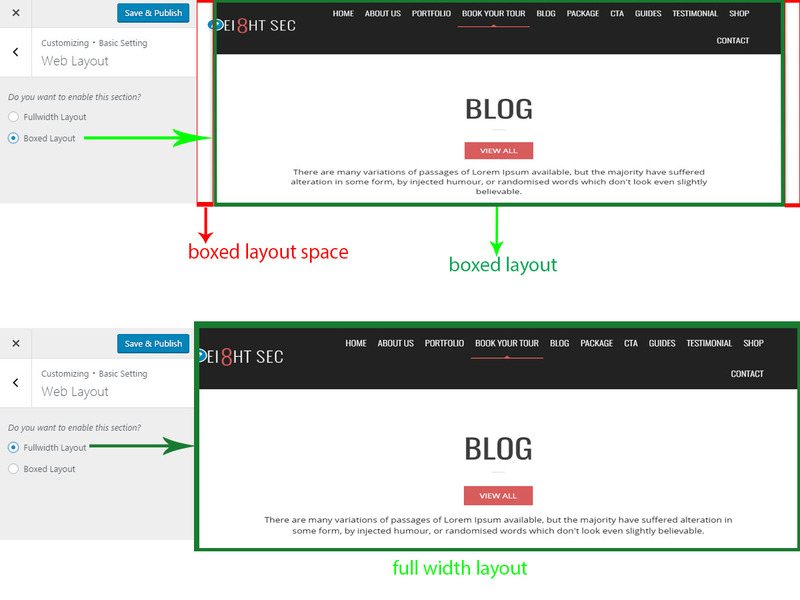 Choose the page layout for the Blog Page. 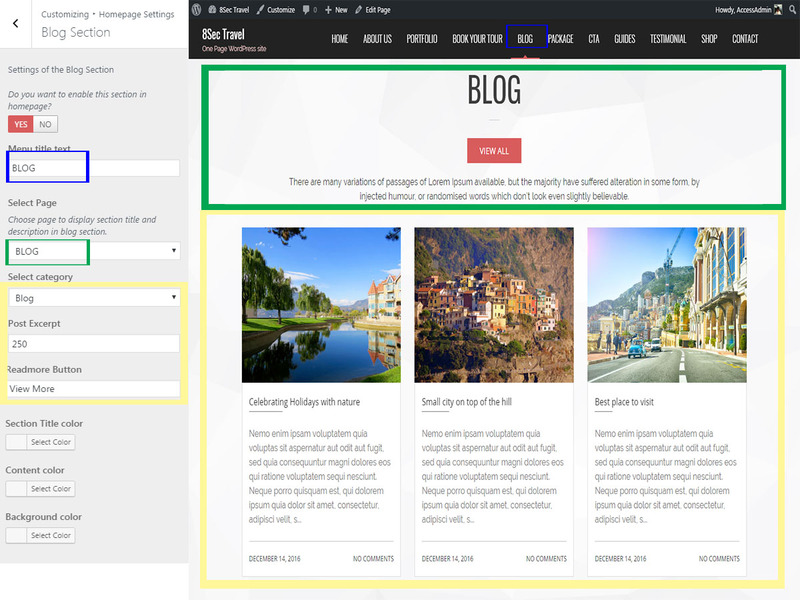 Choose the post layout for the Blog Page. Choose the post content type. Choose Default excerpt to use wordpress default excerpt. Full content to show all the content of post. Custom Excerpt to show the content using custom excerpt length. Select Custom Excerpt in content type to add Custom excerpt length . Enter text to show in read more button of all the posts. Choose the page layout for the Portfolio Page. 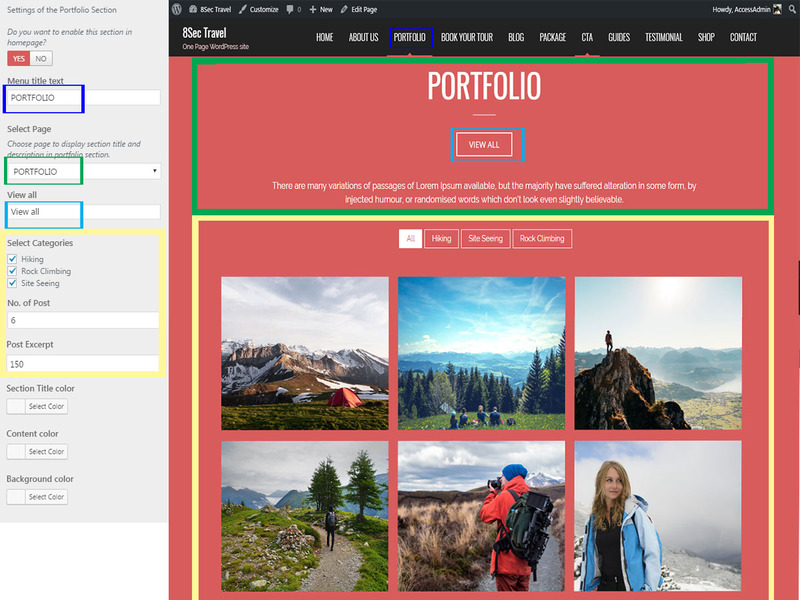 Choose the post layout for the Portfolio Page. Choose the categories to show on Portfolio Page. 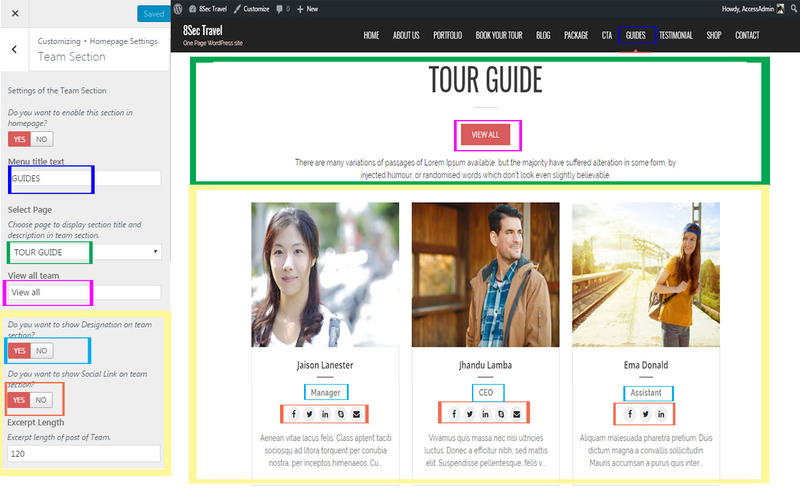 Choose the page layout for the Service Page. Choose the post layout for the Service Page. Select icon or image to show on the post of Service Page. 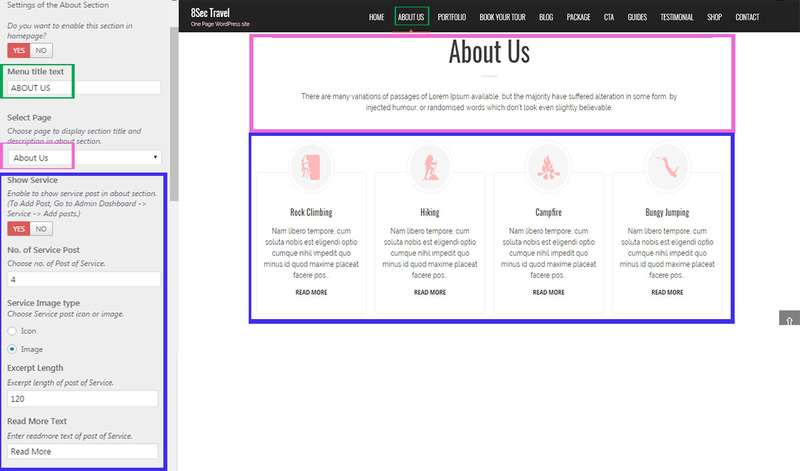 Choose the page layout for the Team Page. Choose the post layout for the Team Page. Select “Yes” to show Designation of the posts on Team Page. Select “Yes” to show Social Link of the posts on Team Page. 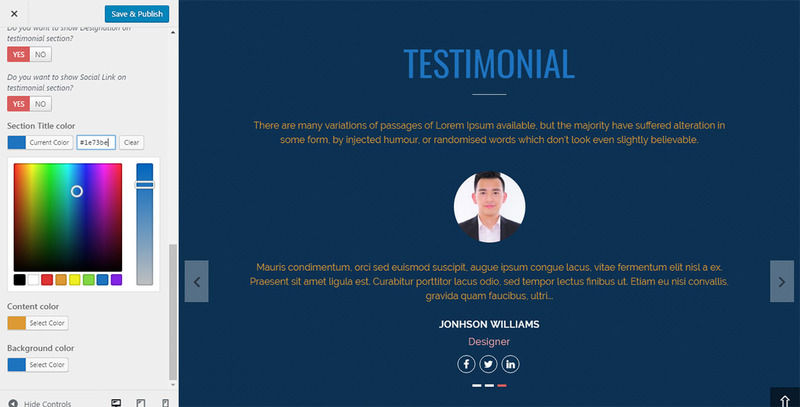 Choose the page layout for the Testimonial Page. 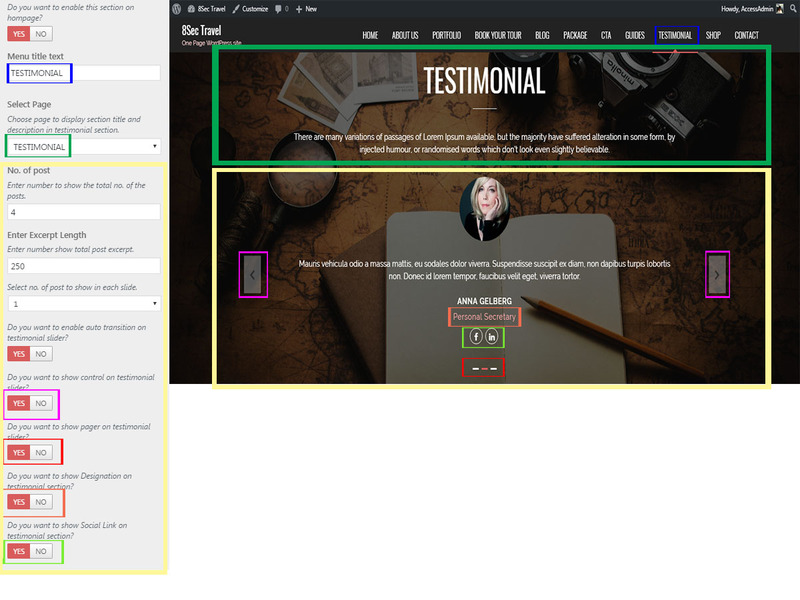 Choose the post layout for the Testimonial Page. Select “Yes” to show Designation of the posts on Testimonial Page. Select “Yes” to show Social Link of the posts on Testimonial Page. Choose the page layout for the Archive Page. Choose the post layout for the Archive Page. Select “Yes” to display breadcrumb in your whole site. Enter the symbol to use the Breadcrumb separator. Enter the text to indicate the homepage. Choose the text color of parent breadcrumb. Select “Yes” to enable social links in Header. Select “Yes” to enable social links in Footer. Enter all the social links url that you want to show on Header and footer. You need to select one of the homepage template. 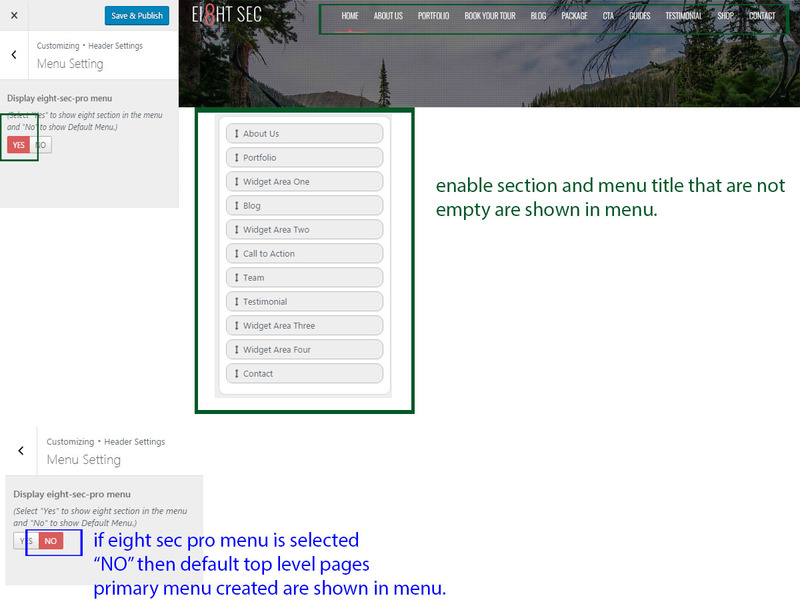 Go to Dashboard > Appearance > Customize > Header Setting > Menu Setting then check eight sec menu. Enabling this option will add the menu text of each section if you enable those section. Enter the CSS codes to edit design.